“In Venice, magic is not unusual. Merle is apprenticed to a magic mirror maker, and Serafin – a boy who was once a master thief – works for a weaver of magic cloth. 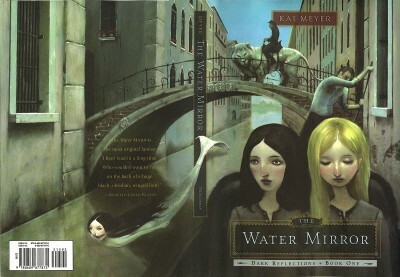 Merle and Serafin are used to the mermaids who live in the canals of the city — beautiful creatures with hideous mouths that split their faces from ear to ear. Disappointing. I glommed onto this while bookshopping with Kakaner when I saw the cover art (by Jonathan Weiner), and couldn’t put it back on the shelf. This could have been a very nice dark-fantasy YA morsel – fast-paced, with a motley cast and an alternate Venice satisfyingly redolent of wartime paranoia and esoteric secrets whispered in clammy alleyways. Note that this is written from Merle’s perspective, so it makes no sense that she should “appear” to be spellbound. Of course it’s hard to say whether choices like these are original to the (German) text, or due to the translator, but there are also occasional outbreaks of ridiculousness that are more easily attributed to the translator, as when a mermaid’s skeleton is described as resembling a “supergigantic fish bone.” SUPERGIGANTIC. Boo, translator. This makes me curious about the editorial process for works in translation. In any case, good brain candy if you’re one for intriguing world-building, but I didn’t find too much else of substance to enjoy. I’m still thinking about framing the cover art, though! That mermaid, boy o boy. Nice cover art. Shame about the book!